Bill Donberg (pictured with a family in Haiti) is passionate about the work of Pure Water for the World. So passionate that he and his wife, Phyllis, have offered to match EVERY donation made for GivingTuesday, dollar for dollar, up to $15,000. Bill firmly believes that a donation to PWW is not a gift, but an investment (see video below). This GivingTuesday match is offered to help make YOUR investment go even further. Bill and Phyllis are extending their match for those who want to get a jump start on GivingTuesday and donate TODAY. Accepting donations early…*CLICK HERE* TO DONATE NOW! Let’s leave no dollar unmatched! To secure the full $15,000 match, please make your donation and then share this unique opportunity with your friends, families and communities. Together, we can change the lives of over 2,000 underserved children and their families…IN JUST ONE DAY! “This is an investment.” from Pure Water for the World on Vimeo. 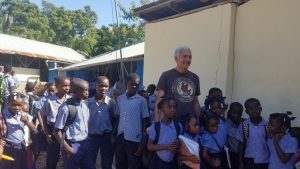 Bill became involved with PWW about seven years ago, when his Michigan Rotary Club supported one of PWW’s clean water projects in Haiti. After researching the organization, he was very impressed by what he was finding out, and the seeds of his relationship with PWW were firmly planted. 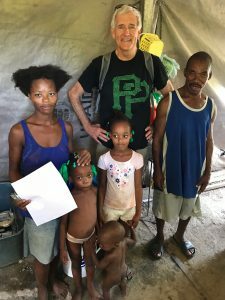 A year later, Bill had an opportunity to travel with PWW to Haiti and witness, in person, the impact of the club’s investment. This is when his passion for PWW really began to flourish. Bill was impressed by the comprehensive nature of the safe water program, and he was deeply moved by the hard work of the PWW team and their profound dedication to improving the lives of the people in their country. “The PWW program has a long record of proven results stemming from a comprehensive process based on community involvement, hygiene education, clean water technology and ongoing follow up. There is a deeply personal commitment by the PWW staff, who are dedicated to improving life for the people of their countries. I have personally seen them change communities by saving lives and restoring hope! Bill has traveled to Haiti with PWW seven times, and the seed that was planted seven years ago continues to thrive. Bill’s passion for this work not only improves the health and lives of the people of Haiti and Honduras, but it also nourishes his soul. PWW is sincerely grateful for Bill’s involvement and commitment. CLICK HERE to DOUBLE your impact and change TWICE the lives. Your generous gift will not only save lives…it will provide children and their families the foundation for a much brighter future. Uncategorized #GivingTuesday, Haiti, Matching Donor, Rotary, safe water, water. permalink.